This study presents ways in which youth work prevents radicalisation leading to violence and identifies inspiring youth work practices. In order to examine how different actors have been dealing with potential violent radicalisation of young people, the SALTO EuroMed, SALTO EECA and SALTO SEE Resource Centres, the National Agencies of Erasmus +: Youth in Action of Germany, the United Kingdom, France, Italy, the Netherlands, Norway and Poland, and European Union and Council of Europe Youth Partnership have come together to research and showcase positive ways and initiatives in which youth violent radicalisation can be addressed and prevented, and examine how we can strengthen the role of different actors, in an attempt to compile a long-term strategy about youth work against violent radicalisation. The 20 practices included in this research offer different perspectives on how diverse youth work approaches and methods can shape young peoples attitudes, perceptions and behaviours. These practices are grouped in five categories: peer education; online campaigns and digital media; co-operation with other stakeholders; providing opportunities and education and training. 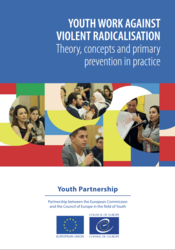 While all the practices presented here use more than one approach in the prevention of violent radicalisation, the grouping serves to showcase the interdisciplinary nature of the work, and a variety of approaches, activities and frameworks that youth workers use in their everyday activities. Take a holistic approach to preventing violent radicalisation, linked to intercultural education, human rights, peace education, media literacy, citizenship education etc. Peer-horizontal, trust-based and non-hierarchical relations allow for easier confrontation with sensitive and personal issues. Building partnerships with other community actors is crucial in transferring the values of youth work to the entire community. Empower young people and develop their competences, which will give them more opportunities and better future perspectives in their personal and professional lives. Provide young people with alternatives and role models. Deal explicitly with messages inciting violence and hate speech, by developing young peoples critical thinking and being open and honest with young people. 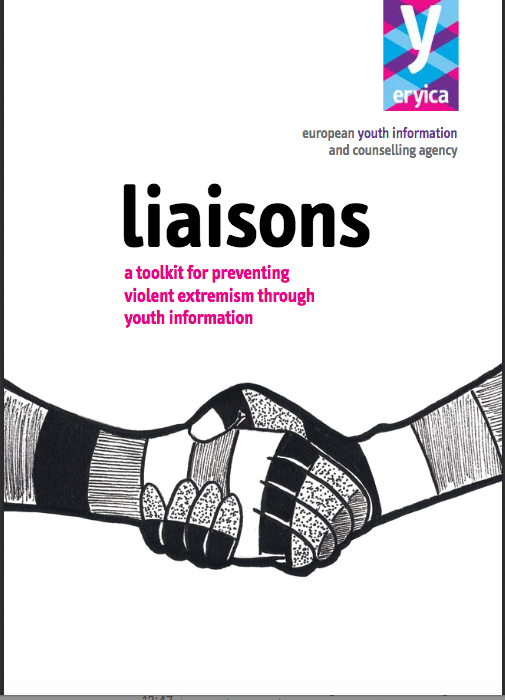 Liaisons is the product of the Partnership Agreement between the Council of Europe and the European Youth Information and Counselling Agency (ERYICA). The Partnership aims to promote and develop European co-operation within the field of youth information and counselling. Methods include, in particular, the development of training activities and resources for actors working in the youth sector, in line with the needs and demands expressed by Members States of the Council of Europe and other countrieswho have signed up to the European Cultural Convention. At present, those working in politics and the youth sector are looking to put in place mechanisms, structures and action plans to prevent and counteract the evolution of radicalisation and violent extremism amongst young people. The Council of Europe, ERYICA and its Francophone members (CIDJ France, CIJ Luxembourg, CIDJ Belgium and Infor Jeunes Bruxelles) highlight the importance of youth information and counselling in achieving this aim, as well as the fundamental role that working together with key stakeholders may play in preventing this phenomenon. Get theoretical and practical support, information and insights – for youth workers, policy-makers, youth and education practitioners and organisations responding to the risks of radicalisation and extremism.This resource pack offers ideas, examples and practical techniques through which youth workers, community workers and policymakers can engage with challenging questions and better understand the context young people are living in.It explores the role of youth work in responding to the risks to young people from different forms of extremism. Alongside each section, there are questions to aid critical reflection and help you think about the best way to apply these ideas in your context and with the young people you work with.The pack also includes a number of case studies (showing how some of these techniques have been put into practice) and tools and practical ideas you can implement in your own work. The conference represents the second stage in a long-term strategy about youth work against violent radicalisation, involving various European countries and Europe’s neighbouring regions. It was based on the outcomes of a mapping exercise aimed at showcasing the positive ways and initiatives in which youth violent radicalisation can be addressed. Within the framework of the mapping exercise, youth workers, youth led organisations and NGOs for youth, informal groups, institutions and public authorities implementing social, cultural, educational, political and sportsrelated activities through youth work were invited to complete a survey according to specific criteria. The goal was to draw lessons, conclusions and recommendations regarding the needs and challenges of youth work at different levels. 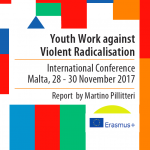 The full report of the Coference “Youth Work against Violenet Radicalisation” is available on line .